FAQ - Wuxi Weifeng Dyeing & Finishing Machinery Co.,Ltd. This is a certificate of suspended platform for ZLP1000, ZLP800, ZLP630 and ZLP500. “Certificate of conformity GOST R (also known as quality certificate, State Standard Certificate, clearance certificate, GOST R certificate and etc.) – is a document, issued in accordance with the rules of certification system in order to confirm correspondence of quality and safety of certified products (services) to the stated requirements, applicable standards (GOST, GOST R, GOST R IEEC, GOST R ISO and etc.). Certification of products (services) may be obligatory and voluntary. This type of a certificate is valid for a period identified in a certification document. Certification is carried out by our specialists on production premises of a company seeking certification of goods it manufactures. On the basis of results obtained during testing samples of goods in a laboratory an appropriate certificate of series production compliance is issued. With more and more high rise buildings appearing all over the world, high rise building cleaning has become more and more important. The article mainly introduces the suspended platform (swing stage) application on the high rise building facades cleaning, and its advantages than BMU and Bosun’s chair. Exterior works of high rise building include high rise window cleaning, exterior wall cleaning, curtain wall clean, high-rise exterior wall paint, concrete repairs, sealing and aerial advertising installation etc. This article mainly introduces the application of suspended work platform in high rise external wall cleaning. The BMU is a special equipment for exterior wall cleaning of high-rise building. Its main usage is cleaning exterior wall of modern high-rise building, which change the traditional suspended work operation into automatic, efficient, high quality mechanical operation. It is the latest generation of powerful exterior wall cleaning robot, and fills up the blank from domestic to overseas in high-rise building exterior wall maintenance. In China, some of senior high-grade constructions, which were built in 80-1990s, were designed by foreign architects and they had considered the installation of BMU since then and adopted abroad BMU to maintenance building. These efforts have laid a good foundation for building cleaning. But since 1990s, there are many buildings had not considered the application of BMU when they were designed and some of them can not be installed BMU, at the same time, BMU does not belong to standard products and also often bring higher cost, all of those lead to BMU has not been widely used nowadays. Because of Bosun’s Chair’s flexibility, it has been widely adopted in the world. However, as its risk in operation and often brings accidents, the Bosun’s Chair has been more and more replaced by suspended work platform. We believe this is a tendency of development. Now, in China, many cities have already stipulated that in aerial work cleaning, workers must use suspended work platform and forbid to use Bosun’s Chair , to avoid more accidents happening. The suspended work platform is a new type of aloft working machinery. Because of it’s operate smoothly, comfort, safety, energy saving etc, it has been widely used in domestic decoration and cleaning industry. The main materials of exterior wall include glass curtain wall, Aluminum composite plate, marble, granite, mosaic, ceramics, drying sticky stone, granitic plaster stone and so on. Due to the dust, grease and erosion caused by acid rain (fog), the new buildings become smudgy easily in short time, especially in some serious air pollution cities. According to the weight-bearing ability, the suspended work platform can be divided into 1000kgs, 800kgs, 600kgs, 500kgs and 250kgs etc. According to the length of platform, it contains 10m, 7.5m, 6m, 4m, 2m and so on. The length of platform can be assembled to suit for different requests. Now the main types that are usually used in cleaning industry include ZLP630 and ZLP250 and the length ranged from 6 to 10 meters is more popular. 1) Check the work site and assure the plan. Check the roof condition and ensure that it can be installed suspended work platform and sure the movement has no obstacle like neon lights and billboard. The engineers design construction plan. 2) To ensure the construction environment without wind, snow and high temperature, low temperature phenomenon. The wind in site should less than 6 levels. 3) Prepare cleaning tools such as bucket, gun, towels and sucker etc. 4) Two workers carry cleaning tools, get into platform cradle and fasten safety belts. Do safety inspection before operation. 1) To check each parts in suspended work platform (swing stage), for exam, if the fasteners, fittings, hoister, and safety protection devices in good state and confirm no hidden dangerous before work. 2) To check whether the suspension mechanism installed on roof, fasteners, drawing rope are firm and confirm no hidden trouble in operation. 3) To check the length of safety rope and see if there were any damage or broken stocks on it. 4) Fixed the safety rope and confirm the length is more than building height. 5) To check the insurance belt employee used no damage. 6) To check if the safety lock is flexible and reliable. 7) To check if the fixed position where the safety rope joined on the top of building is firmly. 8) To check if the staff dresses meet the following requirements: wearing a helmet and wearing long-sleeved work jacket and long pants. In corrosive environment, let workers wear corrosion-resistant clothes and shoes with soft bottom, which also features of corrosion-resistant. 9) To check if the junction between safety rope and building parapet has the liners. If found no, we shall be stop working immediately. 10) The employee’s self-lock device installed on insurance belt should be knotted on safety rope, not buckle in suspended platform. 11) Please set up the fence in operation area and arrange one ground security officer to preventing pedestrians. If no security officer or protecting fence, we should stop the work. 12. Check the attitude of workers who operate in top of buildings, if have some problems, stop working. 1) Use water gun to wash corners and remove dust. 2) Dip spreader into barrels and after it fully absorb sanitizer, we smear evenly on the surface of glass. Later use wiper scrape glass up and down including window frame and corners. Ensure to pull crossly and no miss some small place and then use towel dry it. 3) After finishing one position, let the platform move to the below site and when end the cleaning from top to bottom, we turn left or right to adjacent position and continue to work from top to bottom again. 4) After finishing total work, sorting machines and tools and remove fences and billboard and clean the water on ground. 5) Cleaning and maintenance equipment and after removing dust and dirt we pack the device in warehouse. The suspended scaffolding is high-efficiency modern overhead operation equipment capable of replacing a traditional scaffold and being reused. Generally, the suspended scaffolding can be divided into two kinds: manual and electric. It is widely applied to the outer wall construction, curtain wall installation and outer wall cleaning and maintenance in high rise; and it can be also applied to large tanks, bridges, dams and other engineering operations. The suspended scaffolding is manufactured by the manufacturer with the building mechanical production license ; its product quality must meet the stipulation of industrial standards “Safety Inspection Standard of Building Construction” and “Safety Rule of Suspended Platform for Overhead Operation”; moreover, the construction company uses the suspended platform which is recommended by the building safety supervision institution and is identified to be qualified according to “Supervision Management Rule of using Safety Protective Tool and Mechanical Equipment in Construction Site”; No matter which kind of suspended platform or scaffold is used, it must verify the strengthen and rigidity of the working platform and the outrigger structure and the safety coefficient of the steel wire is verified; and all data and reports need to be reviewed and approved by the superior. When manufacturing and assembling the suspended platform, it shall enhance the technical safety supervision and inspect the quality strictly; after being checked and accepted by the superior technical, quality and safety departments, it can be put into use so as to guarantee safe construction. (1)The scaffold is widely applied to houses, bridges, culverts, tunnels, funnels, water towers, dams, large-span canopy frames and various engineering constructions. Wherein, the member node of the bowl clasp type scaffold is connected by the bowl clasps, which is in stable connection; the combined scaffold has good integration performance; therefore, it has rapid development in application while the gate-type steel tube scaffold can be used as the external scaffold, inner scaffold and full scaffold; it has the features of standardized dimension, reasonable structure, good stress performance, easy detachment and installation in construction, safety, reliability, economy and practicability and thus becomes one of the commonest scaffolds in the world. If the wheels are installed under the gate frame, it can be used as a mobile worktable for motor installation, painting, equipment maintenance, ads manufacturing; moreover, the external scaffold in the construction has two kinds: single row and double rows; there is only one row of vertical columns in the single row type; the other end of the horizontal pole is born on the wall; the scaffold on the metope needs to be repaired. The external scaffold needs to be bond with the outer wall to increase its stability. One binding piece can be set every three steps and spans; the binding piece can be divided to a rigid type and a soft type. The inner scaffold is installed inside the buildings and used for bricking the wall or decorating the inside. Generally, the inner scaffold is a tool type including a folded type, a support column type, a gate frame type and other structural forms; and it has the features of portability, flexibility, convenience in installation and detachment. A. Building decoration, cleaning, and maintenance. As building cleaning and maintenance equipment, the hanging basket is widely adopted in high rise. It can be matched with many device on the roof to complete the cleaning and maintenance, which is simple and reliable in operation and low in maintenance cost. The hanging basket is commonly adopted in inspecting, maintaining and constructing the bridge in foreign developed countries; China also adopts it in the renovation of many large-scale bridges. C. Application in other industries. The hanging scaffold is widely applied to vessel decoration in the vessel manufacturing industry, installation and maintenance of large-scale cables, overhaul of large dams and installation of shaft elevator orbit. 4) Compared with the scaffold, which advantages does the suspended platform have? The scaffold shall be used in the building with stories less than 6 floors. Generally, the height of the scaffold is about 2 meters, which is accumulated and laid one by one; considering its stability, the scaffold is also used in low-story buildings or ad plaque. During the construction of main body, it adopts a subsectional hanging method; after completing the main body, total scaffolds are detached; and the powered suspended platform is used to greatly save the rental fee and shorten the pipeline use time; and it is very rapid, convenient and safe in construction. It adopts subsectional hanging in the construction site; total scaffolds are detached after it cuts off water for the main body; therefore, the safety grid, the pocket grid and the paint have little amount; and it doesn’t need the fully-laid frames; and it can save the production cost again. During the construction period, it adopts vertical transportation in the construction site; when building up the outer frame, it can greatly alleviate the labor strength of the operator; if the condition allows, it can adopt a single-row protective frame in the individual place or part, thereby reducing the labor cost caused by vertical transportation. As it adopts subsectional build-up, it consumes less amount than the fully scaffold, which will greatly save the consumption, transportation fee, loading and unloading fee, joist steel cost, cleaning fee and low consumable cost. 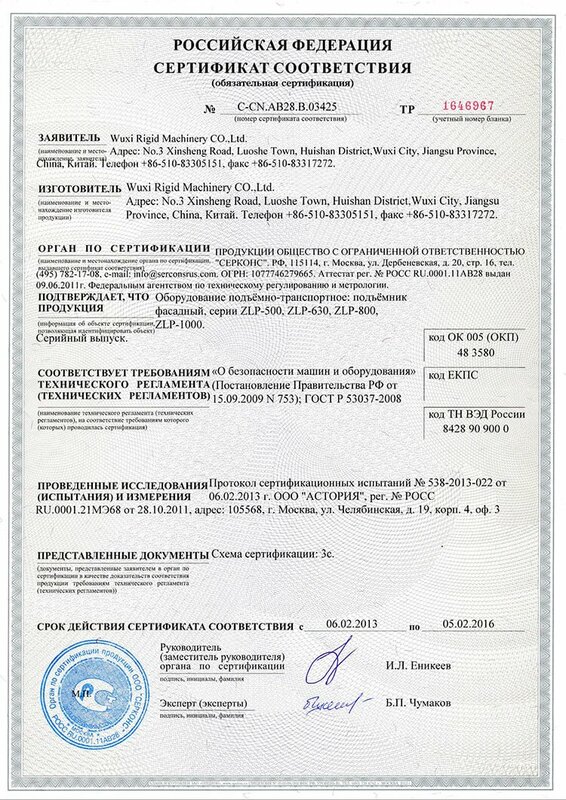 1) This is a certificate of the hoist of suspended platform, and the hoists’ type is LTD80,LTD63, LTD50. 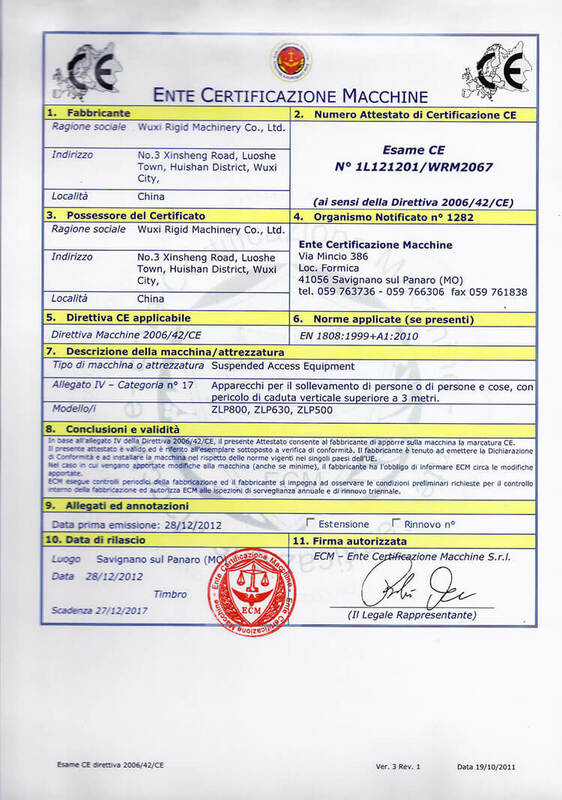 This certificate is authorized by Ente Certificazione Macchine of Italy. 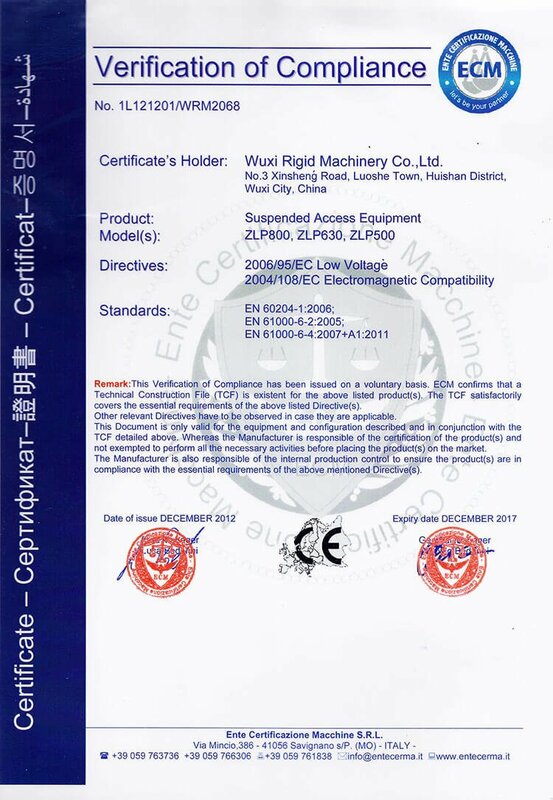 2) This is a certificate of suspended platform, and the types are ZLP800,ZLP630,ZLP500. 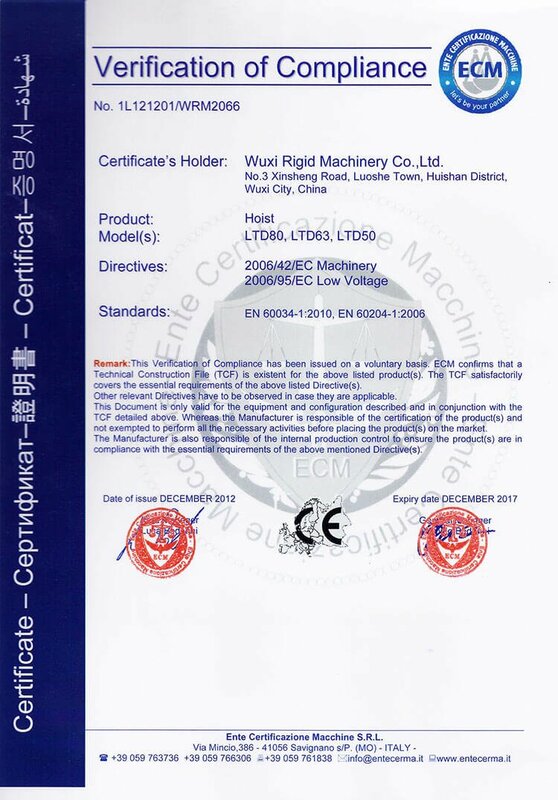 3) This certificate indicates that our products ZLP800, ZLP630, ZLP500 have arrived the demands of Directive Machine 2006/42/CE with the Standards of EN 1808:1999+A1:2010 . Machinery Directive 2006/42/EC was published in 2006, is enforceable in the December 29, 2009. (g) the mechanical semi-finished mechanical means. Manufacturers take this program to the mechanical compliance assessment must be in mechanical design, manufacturing, final inspection and testing process to run in line with the relevant requirements of the quality management system and accept the supervision of the designated agency. China Construction Machinery Association (CCMA) is a registered national construction machinery industry organization officially approved by the Ministry of Civil Affairs of the people’s Republic of China, which is a social organization with the legal person position voluntarily established by and consisting of the manufacturers, institutes, universities, service providers and other construction equipment related entities in the construction machinery industry. Our professional authority is State-owned Assets Supervision and Administration Commission of the State Council (SASAC). The current CCMA is the consolidation of former CCMA and China Building Machinery Association. CCMA now has more than 2，100 members, covering over 85% of the whole industry. The memberships include the relevant units from more than 10 sectors such as Machinery, Urban Construction, Transportation, Railway, Metallurgy, Coal, Building Materials, Oil and Natural Gas, Water Conservancy, Electric power, Forestry, Military Industry and Aviation, distributed at all the Provinces, Municipalities and Autonomous Regions except for Taiwan and Tibet. Equipment, Boring Equipment, Concrete Product Equipment, Piling Machinery, Municipal and Utility Equipment, Arial Working Equipment, Decoration Equipment, Re-bar and Pre-stressed Concrete Machinery, Construction Machinery for Army, railway construction machinery, Elevator and Escalator, Other Specialized Construction Equipment, Parts and Components for Construction Machinery. The Association aims to provide services to enterprises, government and customers and to stimulate the development of Chinese construction machinery industry. The Tasks of the Association are to protect the legal rights of the memberships, reflect the wills and requirements of memberships, coordinate the internal relations within the industry, carry out the state laws, regulations and policies, stipulate the rules and specifications for the industry, put forward the policy suggestions stimulating the industry development, assist the government to perform the macro industry management, fulfill the preparatory work of industry development planning and play the bridging and liaison role between government and enterprises. The Association has close relations with enterprises and customers and proactively serves the enterprises and customers. The Association has done lots of work in such aspects as planning, information, statistics, exhibition, product research and development, marketing, organizational adjustment, customer services, quality, consulting and pricing. The Association has establishes wide contacts with foreign associations and enterprises in this industry and contributed to the advances technology introduction, introduction of foreign funds, international technical cooperation and exchange, and the improvement of enterprises’ economic benefits and product quality. Decoration and Aerial Work Machinery Branch of CHINA CONSTRUCTION MACHINERY ASSOCIATION (CCMA), is approved by the Ministry of Civil Affairs (representative) bodies, registration certificate number: community card characters 3240-20. As a national centralized management unit, branch is jointed by the enterprises which are related in the field of decoration machinery and high-altitude operations, mechanical product design, manufacturing, scientific research detection units, sales and leasing and others. The business scope approved by the National is as below: industry management, technical advice, information, statistics, standard training, qualification assessment, international cooperation for the decoration machinery, aerial work platform (car), suspended platform, window cleaning machines, garden machinery. The purpose of the Branch is services to businesses, governments and users, and promotes the development of the decoration and aerial work machinery industry, the Branch’s mission is to safeguard the legitimate rights and interests of its members, to reflect members’ wishes and requirements, coordination of intra-industry relations, the implementation of national laws, regulations guild regulations and policies, develop, and actively promote industry self-management, put forward policy recommendations to promote the development of the industry, and to play a role of bridge and link between government and enterprises.